Capt. Arleigh Burke on the bridge wing of his DesRon 23 flagship Charles Ausburne. Naval History & Heritage Command photo NH 55883. Capt. Arleigh Burke, ca. 1945. Arleigh Albert Burke was born on 19 October 1901 on a farm near Boulder, Colorado. Appointed to the Naval Academy in 1919, he was commissioned with the rank of ensign in June 1923. From then until April 1928, he was an officer in the battleship Arizona. Burke was next assigned to the Fleet Base Force flagship Procyon, in which he was Flag Lieutenant and Force Personnel Officer. Resuming his formal education in June 1929, Lieutenant Burke received a Master’s Degree from the University of Michigan two years later and then served in the heavy cruiser Chester. He spent the mid-1930s on the Base Force staff and at the Bureau of Ordnance in Washington, D.C. In 1937 he joined the destroyer Craven and, in June 1939, took command of Mugford. Between mid-1940 and late 1942, Burke was assigned to the Naval Gun Factory as an ordnance inspector. Promoted to commander during that time, he next commanded two destroyer divisions and Destroyer Squadron 12 in the South Pacific war zone. He was given a temporary promotion to captain in mid-1943 and in October of that year took command of Destroyer Squadron 23. Flying his flag in Charles Ausburne, he demonstrated initiative and tactical mastery in a series of engagements. In March 1944, Captain Burke became Chief of Staff to Vice Admiral Marc A. Mitscher, who led the Pacific Fleet’s fast carrier task forces. With the temporary rank of commodore, he served with Admiral Mitscher until nearly the end of the Pacific war, had a brief tour with the Bureau of Ordnance and returned as Mitscher’s Chief of Staff in 1946–1947. Now recognized as an officer of great potential, during 1947–1949 Captain Burke was assigned to the Navy’s General Board, commanded the light cruiser Huntington and was active in the debate over Armed Forces’ roles and missions while serving with the office of the Chief of Naval Operations (CNO). He ended the decade and began the next with the Defense Research and Development Board. Soon after the Korean War began, Rear Admiral Burke went to Japan to become Deputy Chief of Staff to Commander, Naval Forces, Far East. In May–December 1951, he commanded a cruiser division and participated in the Korean War’s vexing armistice negotiations, then returned to Washington to direct the CNO’s Strategic Plans Division. 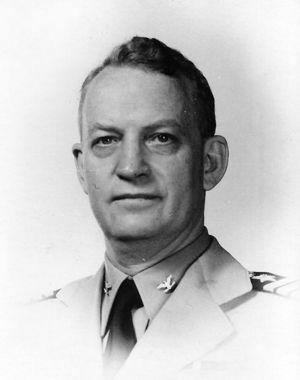 For much of 1954, Burke led a Sixth Fleet cruiser division and, at the beginning of 1955, became Commander of the Atlantic Fleet’s Destroyer Force. In May 1955, Rear Admiral Burke was selected as the next Chief of Naval Operations. Quickly promoted to the rank of admiral, he took over as CNO in mid-August. His three two-year terms took the Navy through great operational and technical changes during a time of constant international tension. After retiring from active duty at the beginning of August 1961 he had an active business and civic life while remaining closely involved with the Navy. Admiral Burke resided in Bethesda, Maryland, near Washington, D.C. and later in the Northern Virginia suburbs, where he died on New Year’s Day 1996.